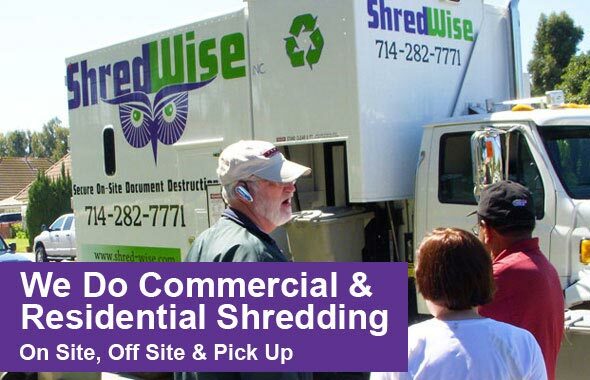 Welcome to Shred Wise Inc.
For dependable, convenient, and affordable paper shredding services in Orange County, call Shred Wise Inc. We are a local, family-owned and -operated shredding company with nearly a decade of experience. We’ve served thousands of satisfied customers since 2006 and have a stellar reputation for providing unparalleled customer service. Our customizable information destruction solutions include on-site, off-site, and pick up or drop-off paper shredding services for both commercial and residential customers. In every scenario, our shredding services help to keep our clients’ sensitive and confidential information safe and secure in accordance with the industry’s best practices and today’s strict privacy laws. Our on-site mobile paper shredding services are available on an as-needed basis for one-time purges, and on a weekly, biweekly, monthly, or bimonthly basis for ongoing document destruction needs. Unlike many of our competitors, our regularly scheduled shredding services don’t require a long-term contract or feature complicated language with hidden fees. Instead, our ongoing mobile shredding service agreements are essentially month to month; set up the frequency of our visits; guarantee our rates for one full year; and allow our clients to use our lockable rolling bins and consoles for the duration of the service agreement at no cost. For those who prefer to have their shredding performed off site, we can pick up your documents at your home, business, or storage facility and transport them securely back to our office, where we can shred your documents in one of our mobile trucks. Alternatively, you can bring your boxes of documents any day of the week directly to our centrally located drop-off location in Orange, California, for shredding. With all of our shredding services, we guarantee that 100% of your paper will be destroyed and recycled. You will also be able to witness the destruction of your documents and then provided with a Certificate of Destruction once we are done. Call today to learn more. 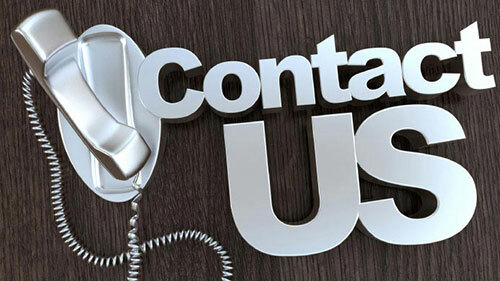 We offer competitive pricing and volume discounts. 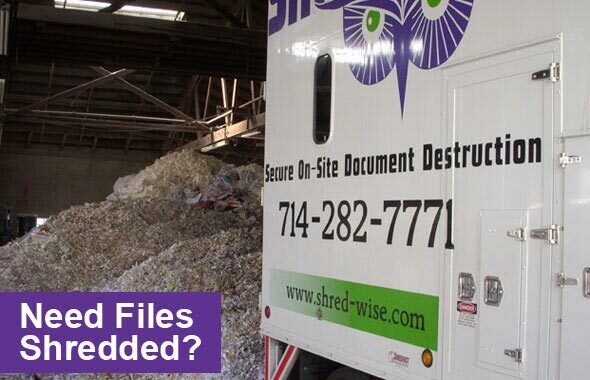 Shred Wise is licensed, bonded, and insured, and compliant with the industry’s best practices and NAID (National Association of Information Destruction) standards. REPUTABLE – We have 1,000s of satisfied clients and glowing reviews on Yelp. EXPERIENCED – We’ve been shredding a wide range of documents for nearly a decade and know how to meet the varied needs of both residential and commercial clients. SECURE – Our paper shredding services are in line with those recommended by NAID, the National Association for Information Destruction. COMPLIANT – Our document destruction practices comply with current local and federal privacy laws, including HIPAA, FACTA, and GLBA. ENVIRONMENTALLY FRIENDLY – 100% of the paper we shred is recycled at a local facility. CONVENIENT – We offer both on-site and off-site document destruction 7 days a week to all of Orange County. FLEXIBLE – With Shred Wise, there’s no long-term commitment requirement. 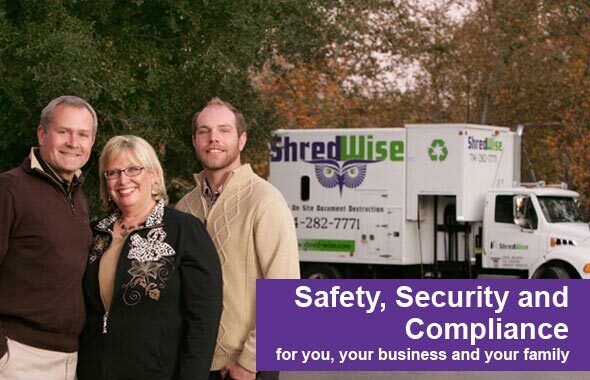 Call us for a one-time purge or to provide ongoing mobile shredding services. Learn what's important! Check out our blog!